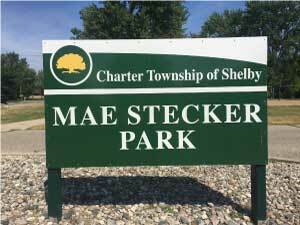 Located at 24 Mile and Van Dyke, Mae Stecker Park opened in 1974 and was named for a former Shelby Township Clerk. This 14-acre park is very popular and is used by many almost every day. The park has a playscape, volleyball court, tennis courts, 3 lighted softball diamonds with scoreboards and basketball courts. There are restrooms and a 1½ mile hiking trail too. In the winter, there is even an ice rink that is setup. There is a pavilion that can be rented for special occasions and is located south of the volleyball court. The pavilion can hold up to 30 people. With all that this park offers it is easy to see why it is so popular and an ideal destination for families with children, sports activities, and for nature lovers. There is always plenty to do and there are always people there enjoying the park. If fishing is your thing, the pond is fishable. Dogs are welcome and the Heritage Garden is a perfect spot for pictures including, family, senior, and prom photos. Bring your camera, take some photos, entertain the family, play a game, and enjoy the outdoors!